Last week we found that Sherrod Brown had a 40/37 approval rating and was in deep trouble for reelection. This week we found that Bill Nelson has a 36/33 approval rating. You would expect with such similar numbers to Brown Nelson would be in big trouble as well. But the Florida Senate numbers we'll release tomorrow show that Nelson isn't in nearly as much danger as Brown, so long as Jeb Bush doesn't run against him. The difference between Brown's standing and Nelson's is an example of the fact that not all approval numbers are created equal- even if they are virtually identical. Here's why: Brown's approval rating with Democrats is 66% while Nelson's is only 45%. For whatever reason Nelson's base is just not that enthused with him. But Nelson is a whole lot more popular with independents- 42% approval compared to Brown's 28%- and a little bit more popular with Republicans as well- 23% approval compared to Brown's 16%. Now let's compare how Nelson does against George LeMieux (who had the median performance of the 5 Republicans we tested in Florida) versus how Brown does against Jon Husted (who had about the mean performance of the 4 Republicans we tested in Ohio.) Brown gets 77% of the Democratic vote, while Nelson gets 71% of the Democratic vote. So even though there's a 21 point disparity between their approval numbers with Democrats there's only a 6 point disparity between their horse race support levels from Democrats. With Republicans Nelson gets 20% of the vote while Brown gets 10% of the vote. 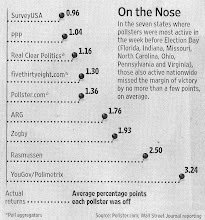 So Nelson's 7 more points of favorability equates to even slightly more than that in horse race support. And with independents Nelson gets 50% while Brown gets 33%, again lining up pretty closely with the disparity in their approval ratings with that group. The bottom line? Not all middling approval ratings are created equal. If you're a Democrat and you're really popular with Democrats but unpopular with independents and Republicans, you're going to be in trouble because you have no crossover support. If you're a Democrat and have middling numbers with Democrats but unusual levels of popularity with Republicans and independents you might come out with the same approval numbers, but your survival prospects are going to be a whole lot better because the Democrats will usually vote for you even if they're not in love with you and you'll pick up the crossover support you need as well. Two other politicians with similar sorts of approval numbers to Nelson come to mind- Governors Jay Nixon in Missouri and Steve Beshear in Kentucky. Neither of them is all that popular with the Democratic base but they hold their own better than most with Republicans and independents and as a result they're both ahead in our most recent polling on their reelection bids as well. For all three of these folks the tepid reviews from Democrats bring down their approval numbers but they're in pretty decent shape for reelection at this point anyway. We'll have the full Florida Senate poll out tomorrow.